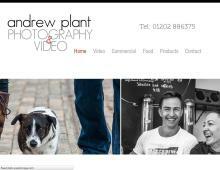 Andrew Plant Photography & Video are a specialist commercial photographer in Dorset with an outstanding reputation. They have been offering high quality commercial photography in Bournemouth, Poole, Dorset and the surrounding areas for many years. Whether you need high resolution images or promotional videos for your website, catalogues or direct mail campaigns Andrew Plant Photography can help! Not only is Andrew Plant a well respected food photographer in Poole, but he is also very popular for lots of other commercial and product photography images such as fashion items, the latest technology, hair products, staff images and much more. If you are looking for a professional video production company in Wimborne, Poole or Bournemouth to help produce your promotional video in Poole or a commercial photographer in Dorset to produce high quality images contact Andrew Plant Photography today.